LOGICO, first published in 1993, has been our best-seller on the national and international market for over 20 years at school, kindergarten and at home. Compact learning frame; no loose parts. Extremely robust and stable. You can drop it without any risk. The buttons can be pushed up and down but not taken away. The LOGICO frame is a universal learning tool. It can be used for all subjects. 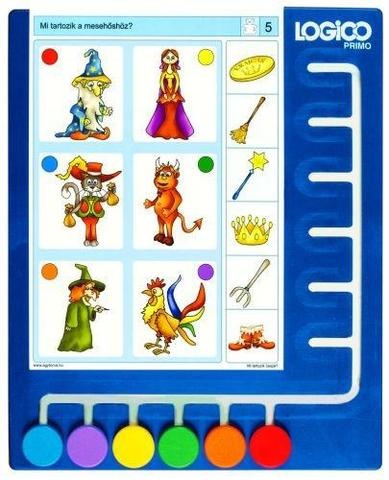 The function is very easy: Just insert the learning card into the frame and move the buttons from the bottom of the frame to one of the answer position at the right. The button is placed there and cannot slide away. Therefore the child can interrupt the learning process at any stage and check himself/herself by turning the card. Easy self-checking by comparing the coloured dots on the reverse of the card with the buttons. After completing all tasks, the child will find the correct answers/solutions on the reverse side. For the child, the solutions shown on the reverse are both, means of control and didactical support. It is not necessary to solve all assignments (questions). The child can always interrupt and check if he/she has answered the questions correctly. This offers additional support for children who need further encouragement. The children can stop with LOGICO at any time, for example, when school hours are over and then continue later. LOGICO is ideal for differentiation and individualized learning. All LOGICO titles are developed by experienced pedagogues and follow new didactical concepts. The illustrations are appropriate for children and very appealing. Many LOGICO titles are illustrated by well-known children's book's illustrators. With LOGICO, children are motivated to become self-directed learners and work with great enthusiasm.